The antibody detects beta Catenin on SDS PAGE immunoblots of Hct116 src transformed cells treated with pervanadate, but not in control cells. Similar results were observed in other pervanadate treated cell lines, such as A431 and human endothelial cells. Immunogen sequence has one amino acid difference from a sequence around tyrosine 133 of human gamma Catenin. These human sequences are highly conserved in rat and mouse beta Catenins. Batches could vary in the level phospho Y133 of gamma catenin recognition. Phospho beta Catenin (Tyr 142) synthetic peptide (coupled to KLH) corresponding to amino acid residues around tyrosine 142 of human beta Catenin. Tyrosine phosphorylation of beta Catenin can regulate its interaction with critical components of adherens junctions. Both Fer and Fyn kinases phosphorylate tyrosine 142 in vitro and overexpression of these kinases in epithelial cells disrupts interactions between alpha and beta Catenins. 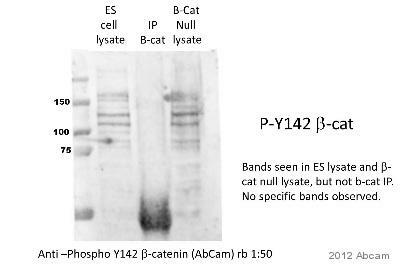 The phosphorylation of tyrosine 142 may act as a switch from the adhesive to the transcriptional role of beta Catenin. Thus, site specific tyrosine phosphorylation of beta Catenin may regulate specific protein protein interactions, leading to changes in cell adhesion. Our Abpromise guarantee covers the use of ab27798 in the following tested applications. WB 1/500. Detects a band of approximately 92 kDa (predicted molecular weight: 86 kDa).Can be blocked with Human beta Catenin (phospho Y142) peptide (ab42714). IP with beta catenin antibody is recommended, followed by probing with ab27798. This improve the distinction between beta Catenin Tyr 142 and gamma Catenin Tyr 133 (Swiss-Prot ID P14923). Key dowstream component of the canonical Wnt signaling pathway. In the absence of Wnt, forms a complex with AXIN1, AXIN2, APC, CSNK1A1 and GSK3B that promotes phosphorylation on N-terminal Ser and Thr residues and ubiquitination of CTNNB1 via BTRC and its subsequent degradation by the proteasome. In the presence of Wnt ligand, CTNNB1 is not ubiquitinated and accumulates in the nucleus, where it acts as a coactivator for transcription factors of the TCF/LEF family, leading to activate Wnt responsive genes. Involved in the regulation of cell adhesion. The majority of beta-catenin is localized to the cell membrane and is part of E-cadherin/catenin adhesion complexes which are proposed to couple cadherins to the actin cytoskeleton. Expressed in several hair follicle cell types: basal and peripheral matrix cells, and cells of the outer and inner root sheaths. Expressed in colon. Defects in CTNNB1 are associated with colorectal cancer (CRC) [MIM:114500]. Note=Activating mutations in CTNNB1 have oncogenic activity resulting in tumor development. Somatic mutations are found in various tumor types, including colon cancers, ovarian and prostate carcinomas, hepatoblastoma (HB), hepatocellular carcinoma (HCC). HBs are malignant embryonal tumors mainly affecting young children in the first three years of life. Defects in CTNNB1 are a cause of pilomatrixoma (PTR) [MIM:132600]; a common benign skin tumor. Defects in CTNNB1 are a cause of medulloblastoma (MDB) [MIM:155255]. MDB is a malignant, invasive embryonal tumor of the cerebellum with a preferential manifestation in children. Defects in CTNNB1 are a cause of susceptibility to ovarian cancer (OC) [MIM:167000]. Ovarian cancer common malignancy originating from ovarian tissue. Although many histologic types of ovarian neoplasms have been described, epithelial ovarian carcinoma is the most common form. Ovarian cancers are often asymptomatic and the recognized signs and symptoms, even of late-stage disease, are vague. Consequently, most patients are diagnosed with advanced disease. Note=A chromosomal aberration involving CTNNB1 is found in salivary gland pleiomorphic adenomas, the most common benign epithelial tumors of the salivary gland. Translocation t(3;8)(p21;q12) with PLAG1. Phosphorylation by GSK3B requires prior phosphorylation of Ser-45 by another kinase. Phosphorylation proceeds then from Thr-41 to Ser-37 and Ser-33. EGF stimulates tyrosine phosphorylation. Phosphorylation on Tyr-654 decreases CDH1 binding and enhances TBP binding. Ubiquitinated by the SCF(BTRC) E3 ligase complex when phosphorylated by GSK3B, leading to its degradation. Ubiquitinated by a E3 ubiquitin ligase complex containing UBE2D1, SIAH1, CACYBP/SIP, SKP1, APC and TBL1X, leading to its subsequent proteasomal degradation. Cytoplasm. Nucleus. Cytoplasm > cytoskeleton. Cell junction > adherens junction. Cell junction. Cell membrane. Cytoplasmic when it is unstabilized (high level of phosphorylation) or bound to CDH1. Translocates to the nucleus when it is stabilized (low level of phosphorylation). Interaction with GLIS2 and MUC1 promotes nuclear translocation. Interaction with EMD inhibits nuclear localization. Lanes 1 & 3 : Hct116 src transformed cells serum starved overnight. Lanes 2 & 4 : Hct116 src transformed cells treated with pervanadate (1 mM) for 30 min. Membrane was incubated with diluted antibody in 5% non-fat milk, PBS, 0.04% Tween20 for 1hour at room temperature. ICC/IF labeling of phosphorylated β-Catenin in paraformaldehyde-fixed and NP-40-permeabilized rabbit spleen fibroblasts. The cells were labeled with mouse monoclonal β-Catenin (left panel) and ab27798 antibodies, then the antibodies were detected using appropriate secondary antibodies conjugated to Cy3. Immunocytochemistry/ Immunofluorescence - Anti-beta Catenin (phospho Y142) antibody (ab27798)Image courtesy of an Abreview submitted by Judit Herreros. 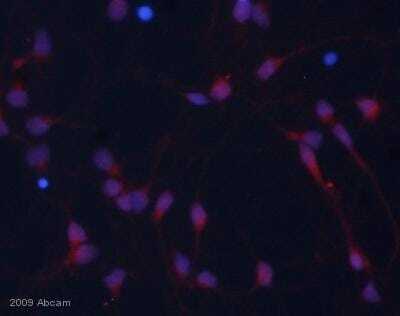 ab27798 staining beta Catenin (phospho Y142) in rat hippocampal neurons by Immunocytochemistry/ Immunofluorescence. The cells were pre-treated with pervanadate for 15 minutes before being fixed in paraformaldehyde and then blocked using 10% serum for 1 hour at 25°C. Samples were then incubated with primary antibody at 1/50 for 8 hours at 4°C. 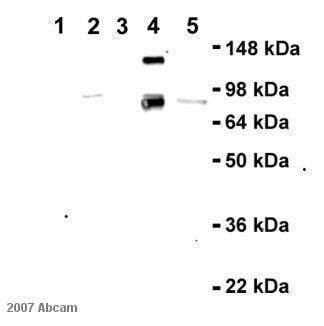 The secondary antibody used was a donkey anti-rabbit IgG conjugated to Alexa Fluor® 594 (red) ab150076) used at a 1/500 dilution. Hoestch was used to stain the cell nuclei (blue). Publishing research using ab27798? Please let us know so that we can cite the reference in this datasheet. For product Anti-beta Catenin (phospho Y142) antibody (ab27798), can you please provide the Pervanadate Treatment Protocol, as used in the WB image for this Ab? Please see below for our protocol for the Pervanadate Treatment of Cells. 1. Grow cells of interest to 80-90% confluency (adherent cells: A431, J774A.1, HUVEC, SYF, RSF, COS7, differentiated PC12) or medium to high cell density (suspension cells: Jurkat, K562, Sp2O, undifferentiated PC12) in culture dishes. 2. Cell stimulations for studies of phosphorylation can examine serum starved cells to reduce basal phosphorylation levels prior to the addition of stimulants. 3. For adherent cells, remove cell culture growth media and rinse cells once in serum-free containing media (usually DMEM or F12K). Next, add serum-free media to each dish and place cells in incubator for 2 hrs (most cell lines) or overnight (A431 only). After serum starvation, add stimulant (treated) or vehicle (control) at the concentration and time required: 1 mM Pervanadate in dH2O for 30 min. (Some cell lines may come off dish with this concentration).